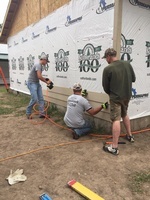 Habitat for Humanity has been in Barton County since 2001. Our non-profit organization gives a hand up, not a hand out. 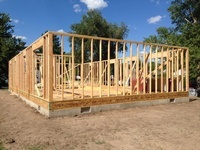 All the donations we receive are used to build or remodel homes for our partner families, who then purchase the home through a zero-interest, 25-year mortgage. 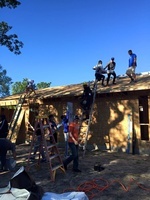 The houses cost less because they are built with volunteer labor and donated materials, and because the partner families do not pay interest, home ownership is much more affordable than in the private market. In addition, the funds collected in mortgage payments can be re-used to help another family in Barton County - it's like the donations keep giving and giving! 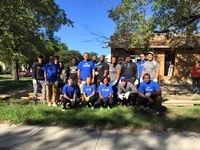 1) They have to be willing to partner - Our families have to put in 300 sweat equity hours on their home and complete a financial counseling series. 2) They have to have the ability to repay - The family needs to have a steady source of income so that they can make consistent mortgage payments, just like they would in a regular bank loan. 3) They have to be in need of affordable housing - The family has to have a need of some sort, whether it is because they are in an unsafe living environment or because their current situation is too expensive.